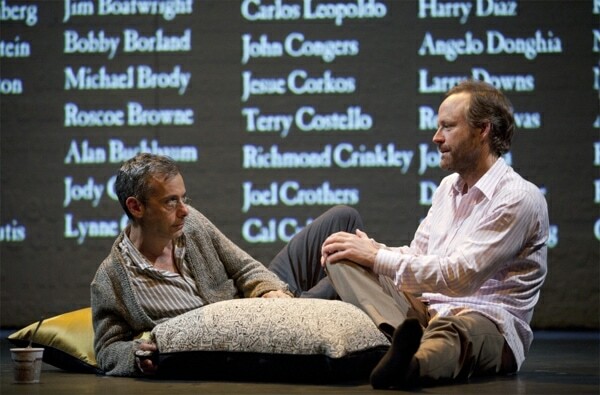 Larry Kramer’s AIDS drama beats passionately, stirs up emotion. Near the end of Larry Kramer’s The Normal Heart, currently in revival on Broadway, there is a steady stretch of scenes throughout which the sounds of sniffles and sobs can be heard across the Golden Theatre, breaking though the silence of an otherwise rapt audience. In a season of fine revivals of plays, this particular piece seems to have struck a chord of recognition. It’s a passionate play about the early days of AIDS, before the acronym had been coined (the syndrome’s name never appears in the play), full of rage and riddled with harrowing statistics, but it’s not the numbers of new cases or the political polemics that ultimately leave their mark on an audience; it’s the very real, very urgent concerns of its characters, and, in particular, of our tragic hero, Ned Weeks. Originally produced at the Public Theater downtown in 1985, The Normal Heart is an autobiographical play focusing on Ned Weeks (Joe Mantello), Kramer’s alter ego, a writer whose interest in the birth pangs of the AIDS epidemic eventually leads him to co-found an advocacy organization, the Gay Men’s Health Crisis (another name which never appears in the play), along with a small but dedicated group of gay men. Ned, who, in the play’s opening scene, meets with pioneering doctor Emma Brookner (Ellen Barkin), ultimately struggles to reconcile his bold political grandstanding, which includes tactics that range from vilifying New York’s mayor to condoning the outing of their organization’s mailing list, with the increasingly tangible fact that the man he loves most, his lover Felix, is among those his newly founded organization is fighting an uphill battle to save. This particular production follows on the heels of a well-received staged reading last fall directed by Joel Grey, whose duties are shared on Broadway by veteran director George C. Wolfe. A play that some may have thought would seem less relevant more than 25 years on touched a nerve, aided no doubt by a powerhouse performance by Joe Mantello as Ned, and rumors of a Broadway run surfaced in the days following the event, originally staged as a benefit for The Actors Fund. Reprising his role for the Broadway production, Mantello sets the stage ablaze with his impassioned performance. His Ned is alternately vulnerable everyman and alienated political pariah, a duality that Mantello understands and inhabits with chameleon-like degree of empathy, ensuring that the character is never less than likable, even in his most abrasive moments. He’s joined by a uniformly excellent cast, particularly John Benjamin Hickey as Felix and Ellen Barkin, whose portrayal of Dr. Brookner represents a formidable Broadway debut, though, on occasion, her passion verges on one-note anger. Lee Pace and Mark Harelik are also affecting in supporting roles, though Harelik, who plays Ned’s lovingly antagonistic older brother Ben, can’t quite match the talents of Victor Garber, who tackled the role in the recent reading. With only minimal sets and props, this fine cast blows any remaining dust off Kramer’s play to be certain. David Rockwell’s tremendously understated set design consists mainly of three white walls, each inscribed with landmark phrases and events from throughout the early years of AIDS written in raised letters. At regular intervals, the names of those who have died of over the course of the play’s events are projected in ever-increasing lists, conveying the urgency of the initiatives at hand. In age where AIDS has come to be perceived, questionably so, as a manageable ailment, the politics of basic healthcare for infected patients has given way to the less pressing politics of gay marriage. Theatergoers lucky enough to experience this production will be reminded of the urgency of our forerunners’ struggles for fair treatment and the sacrifices made in the name of visibility. For a political play, trading occasionally in jargon, The Normal Heart also manages to tug at an audience’s heartstrings while managing to feel effortlessly gut-punching and wholly, viscerally truth-telling. Kramer’s is a play that bears the stamp of its time indelibly, but it’s also a piece that (forgive the cardiac comparison) requires none of time’s defibrillators to maintain its steady pulse. Anyone who’s still got theirs intact will likely leave the theatre the same way the audience did on the night I attended the show, utterly blown away, in a solemn procession of tear-soaked rumination. There’s as much on display here for the head to savor as there is for the heart, and an audience’s captivation is exactly the effect Kramer’s play, as much a call to action as a piece of entertainment, should have on an audience. In a year of excellent productions on Broadway, this is one of the finest in recent memory.